For the first time player, the Craps table can look disorientating. However, all you need be aware of is that the different sections correlate to the different types of bets you can make (for example, Pass Line, Come and Don’t Pass Bar). When you learn the rules of Craps and what the different types of Bets are, it all becomes rather self-explanatory. If you would like help with any of the particular bets that are made on the craps table, please read the Bets & Odds section. 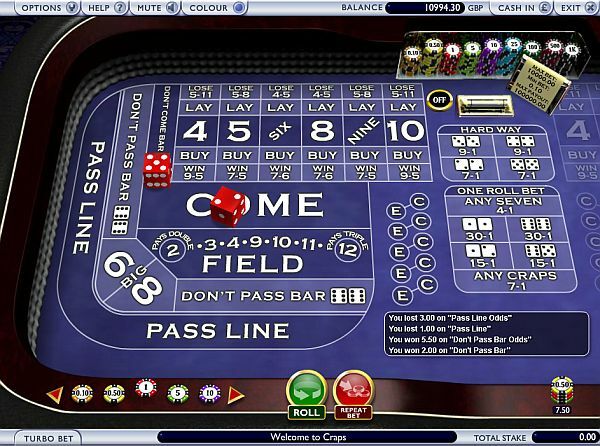 All Craps tables have the same layout; the uniformity makes it easier for players to understand the game. Regular tables have the same layout as small tables, except they’re larger and have symmetry to enable players on each side to play. There are four dealers on a craps table: two base dealers, the Pit Boss and the Stickman. The base dealers take the bets from customers, the Pit Boss guards/exchanges chips and the Stickman collects the dice, reads out the numbers and take Proposition and Field Bets. The Puck is the small disc which has the words On and Off each side. The disc signifies the stage of the game – ON to signify the Come Out has been rolled. The puck also shows newcomers the Point number. There will be four dice in total, however two are ever used in a single game – this is to ensure randomness and security in the game. The dice are rolled by the “Shooter” for the entire betting round. They dash across the table right to the back. All bets are marked on the Craps table. When you place a bet you or the dealer moves your chips into position. For example, the Pass Line is where you put your Pass Line bets for the Come Out roll and the Come area is where you place the Come bets. The “Any 7” section is self-explanatory, it is where you bet for the next 7 to come up. Similarly, the table numbers on the sections are used for Single Roll bets. If you want to bet on the next roll being an 8 than you put your chips there. The area entitled “Any Craps” simply refers to betting on a Craps number (2,3 or 12). These are losing numbers for Pass Line bets and winning for Don’t Pass Bets. The game of Craps is played on a rectangular-shaped table with low, padded walls around it. It is played with a set of two, precision-balanced, six-sided dice. The dice are made of a cellulose or similar plastic material. Each side of each die (cube) has one or more dots (spots) totaling one through six. The combination of the six spots, plus the number of dice in play, determine the mathematical probabilities of any number being thrown. The combined spots on opposite sides of a die add up to the number seven, i.e. six and one, five and two, three and four. The shooter, who stands at one end of the table, starts each game by making a bet. He signifies his bet by placing cash or chips on the appropriate part of the layout before he rolls. The other players may bet on the shooter, against the shooter or make side bets on the outcome of the roll. Once all bets are down, the shooter takes the dice in one hand and tosses them the length of the table, from one end to the other. He must ensure that both dies are thrown hard enough to strike the opposite wall of the table and bounce back onto the surface of the table. At the instant the dice come to rest, the dealer declares the number rolled. That all-important number is based on the combined sum of the spots on the topmost surfaces of the dice, and all winning bets are paid accordingly. Those spots on the dice also determine whether the shooter wins, loses, continues to throw, or loses possession of the dice to another shooter. If he wins, he may continue to bet and roll or he may decide to quit, and give up the dice. Either way, each player in turn gets the chance to become the shooter and toss the dice in an attempt to roll a winning combination. Although variations of Craps are played in Europe, notably England, France, and Monaco, Bank Craps (Las Vegas Craps), and New York Craps, are the versions of the game played most often in the major gambling casinos in North America. All of them use specially designed tables and easy to read printed layouts, and all bets are made against the house.